Brand Name: as per buyers specification. This long sleeve Tshirt features a button up detail front, long sleeves and slim fit. 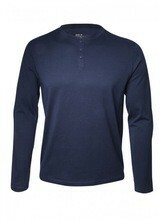 mens long sleeve ribbed double T-shirt with long sleeves, a button up front and small detail on the chest.